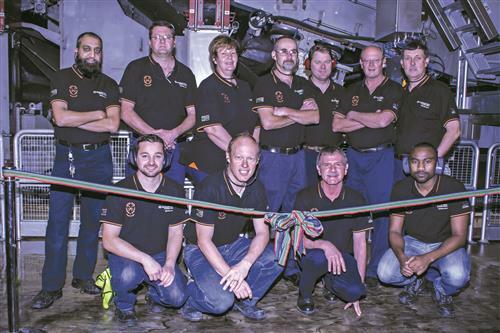 At Kimberley-Clark’s Enstra mill in South Africa they can’t make enough tissue to meet the demand. TWM spoke to the man who aims to steer the tissue giant towards that potential growth as consumers’ trading-up becomes more and more routine. South Africa, known for being the rainbow nation, boasts a population that is uniquely diverse. Spanning nine provinces, it’s home to over 51 million people. Driving through the busy streets and into the outskirts of Johannesburg, the diversity of the consumer base is very evident. We pass grand, high-security houses next to high-rise, designer shopping malls, areas of mass regeneration, as well as local corner shops on the edge of over-spilling townships and spaza shops. The Enstra site is based in the province of Gauteng, which was formed from part of the old Transvaal Province after South Africa’s first all-race elections in 1994. It encompasses two of the country’s largest cities – its administrative capital Pretoria, and also its largest city Johannesburg. Both are highly urbanised and with its population of nearly 12.3m people, it provides a large percentage of the company’s customer base. 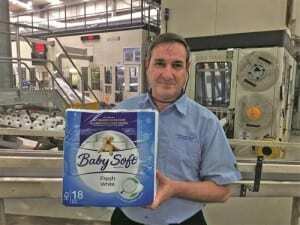 The site’s branded bath tissue products are market leaders in the branded product category space, according to marketing manager Tamaryn McPherson: “Our brand promise of softness to the consumer remains key and even though consumers are constantly facing the impacts of the economic downturn, we find that their need for the softness and quality that the BabySoft® product provides them ensures that they keep on returning to the shelf.” Kimberly-Clark recently introduced a moist toilet tissue to their range: “Introducing this product allowed us to change the conversation with consumers. It helps to shift the perception that toilet tissue is about personal care and not merely household care,” she added. At present, K-C South Africa exports some finished product into West, East and Central Africa. Hulme adds “Although these exports are still small in volume, we have a growing market there and will be looking at effective options to increase supply to this market”. 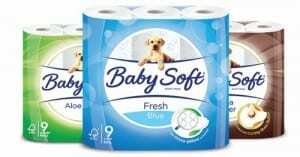 Tissue use is still fairly small but growing in South Africa and K-C keeps an eye on Brazil and other South American countries where tissue markets are more similar than the steady but flat demand seen in Europe. “These countries also provide us with good insights on how we go to market in our traditional trade, which is a fast growing segment for us,” adds McPherson. Significantly, it is the changing dynamics of the local population that hold the most potential for the site. Hulme believes prospects will continue to change significantly in the next few decades. K-C South Africa is in for the long haul. Share the post "Sub-Sahara Africa: An expanding main market opportunity … long term"